They could be onto something. Does the new Going All Out mean staying in, inviting a handful of friends, interacting in your own kitchen with a chef you admire, and doing no more at evening’s end than wish everyone a fond farewell? 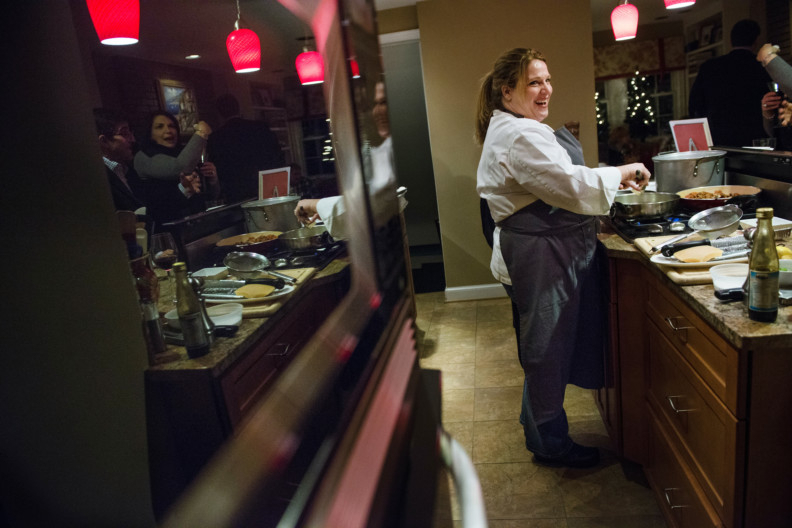 Personal cheffing has long offered convenience for consumers; its most promising incarnation might be Kitchensurfing, (www.kitchensurfing.com) a service offered in six cities across the United States to date. Its online roster of talent features profiles that detail the chefs’ work experience and cuisine strengths. Chief executive Jon Tien says that in New York, his company is piloting a weeknight programme in which customers can book as late in the day as 3pm and have a chef shop, cook and clean that evening for $25 (Dh92) per person. Kitchensurfing doesn’t deal in big names, though you can choose someone who might have worked at, say, the French Laundry. Food Network Chopped host Ted Allen sees that appetite growing. (Top Chef cruise, anyone?) He has been at enough private dinners cooked by celebrity chefs to understand who can afford them outright: the 1-percenters and corporations clued into the lure of high-profile cuisine on home turf. A chef who has earned name-recognition status might charge an appearance fee of several thousand bucks — on top of the cost of a private meal, a sous-chef or two, servers and any tableware rentals. “If you hire Mario Batali, of course you want to taste his food. But what you’re really after is his sparkling repartee, a few photos and being able to introduce him to your friends,” Allen says. “Dinners in private houses are not something I want to do,” says Le Bernardin’s Eric Ripert. “It distracts me from my restaurants, and I want to keep that very high value for our guests.” Still, the super-luminary chef admits he was caught a few years ago when a very persistent woman asked him to do a private birthday dinner for 12 in Las Vegas. Ripert makes one exception. For the past 20 years, he has cooked a “re-creation of the Le Bernardin experience at home” for the bidder who wins his services via the annual fundraising auction for City Harvest, a group dedicated to ending hunger in New York. The cause is dear to Ripert, who is a vice chairman for the organisation’s Food Council. In 2013, his dinner for 20 plus an appearance by his friend Richard Gere set off a bidding frenzy that escalated to $220,000; Gere immediately got the chef to agree to do a second dinner for a separate bidder, for the same amount. 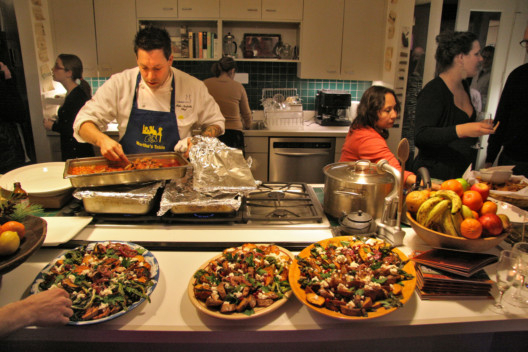 The 32 dinners that chefs cooked and served in private homes for Washington’s Sips & Suppers last year raised more than $500,000 to benefit DC Central Kitchen and Martha’s Table. Hosting a dinner is another way to get a culinary wizard such as David Chang in your front door, but not just any kitchen will do. It has to pass muster beforehand in a visit from event co-host Joan Nathan. Working appliances and enough space to accommodate a sizable team are a must. Brandwein knows that sharing her expertise is part of deal. Thirty minutes before the first canape is delivered, though, she asks for no company in the kitchen: “I’m in concentrated mode,” she says. The chef has devised a detailed system to ensure that things go smoothly, including a spreadsheet checklist for prep and pack-up, and reserving a little of the food for late or unexpected guests. Still, she knows things can go wrong, such as the water-main break that delayed her arrival and forced her and crew to unload and roll all their materials some six blocks to the home. For a recent celebration at the home of Alexandria, Virginia, resident Mary Jane Volk, Brandwein and host agreed on a small-plates-and-pasta theme, due in part to Volk’s small entertaining space. The menu: shots of cauliflower soup; roasted sweet potato with eggplant and Greek yogurt; little meatballs; charcuterie and cheese; egg raviolo with Swiss chard; pappardelle Bolognese; and seared scallops with celery root. Price points for Brandwein’s and Isabella’s services seem reasonable, considering the chefs’ experience and stature. Brandwein quoted a range of $85 to $125 per person, and Isabella $75 to $125 per person, based on a party of 8 to 10, excluding wine, service and rentals. Isabella can’t guarantee he’ll always be the one to run the show; maybe George Pagonis of Kapnos (this season’s Top Chef comeback kid) might be there instead.